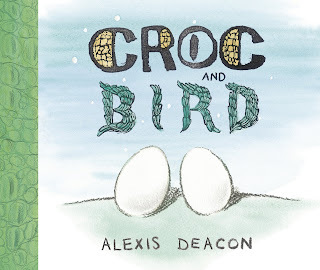 Croc and Bird by Alexis Deacon is a beautifully illustrated picture book with a simple story of two creatures, a crocodile and a bird, who, despite their differences, grow up as brothers. Most preschool children will understand the story is about the differences between the Croc and the Bird but as an adult, when I read the story, I notice a surprising depth of thought when it comes to the observations the tale makes about the differences between the two creatures. I think some of this subtlety is lost of Lara at her age but as she grows older and reads and re-reads this book she will see more and more of the sensitivity with which it is written. The pictures are softly illustrated and are quite dark. Not the type of image that I would usually expect my nearly-three-year old to engage well with but there is something about the fascination of the story that makes her sit and look deep into the pictures and ask me what the Croc and the Bird are doing on each page. When I read Croc and Bird to Lara she tends to be a lot quieter than when I read other stories. I am pretty sure this has something to do with the serenity and peacefulness that comes over me when I read it. There is little excitement in my voice, just a calmness with a level of intrigue! Towards the end of the story, Croc and Bird have to deal with the difficult subjects of isolation, rejection and loneliness. Thankfully, there is a happy ending that makes Lara smile.